My kids love pasta with meat sauce. It’s one of the few meals I make that I know they will eat, even if they’ve had a snack five minutes before dinner (which I never, ever allow because that would be foolish…. insert guilty cough). So when Hodgson Mill sent me an awesome care package after learning about #ONENEWFOOD just so we could try out some of their stuff (thank you Hodgson Mill!! 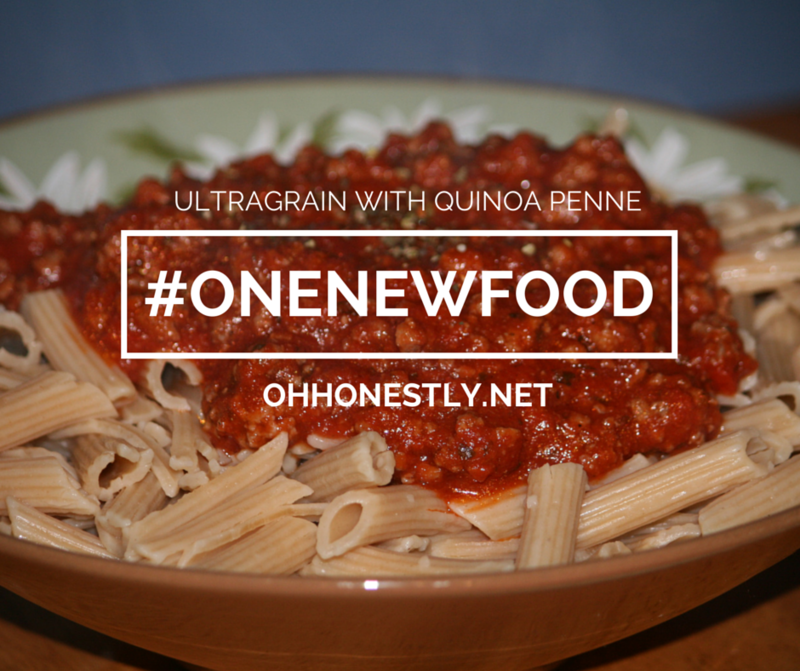 ), I decided to use their Ultragrain with Quinoa Penne as our #ONENEWFOOD of the week. Is considered a Super Food by many people. Want to try out some quinoa recipes? 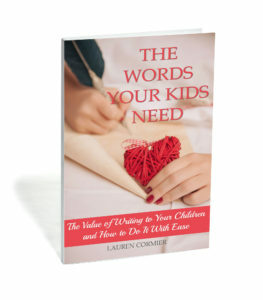 Check out this roundup from Family Gone Healthy. It has something for everyone. I decided to try the video again, and since the kids had a better idea of what I was doing, they were ready, especially Samuel. I think he wins the “Ham of the Week” award. If your kids are reluctant to try out a new food, tell them you’ll film them so they can watch it afterwards. Even if their reaction to the food is negative, they might be more willing to try something new just so they can see themselves on the screen. Check out Kristen’s vlog to get other helpful tips on how to get your kids to try their #ONENEWFOOD. 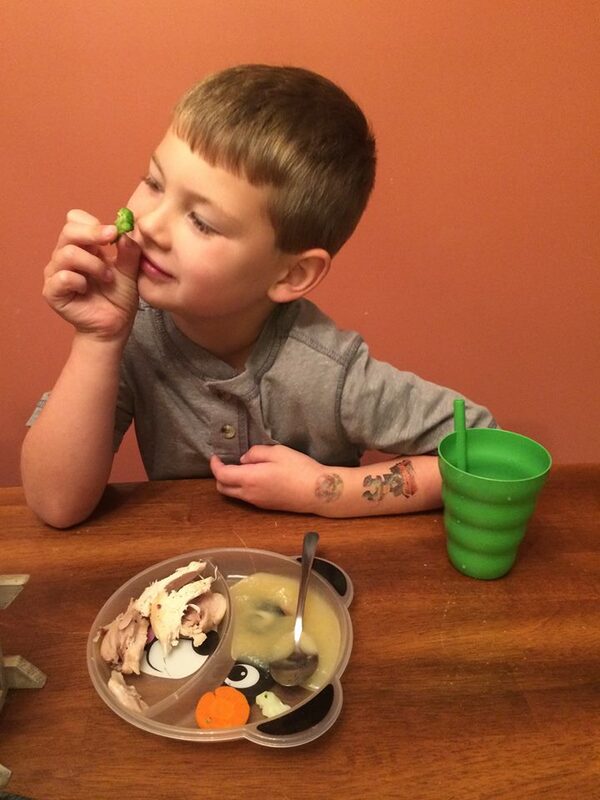 Amanda sent me pictures of her boys trying out a trio of steamed veggies. Her oldest is her pickier eater, but he willingly tried a bite each of broccoli, cauliflower, and carrot, and said he liked the broccoli the best of the three. I’m so glad you and your boys joined us Amanda! I can’t wait to hear what you choose for your next food! This week my family made an easy change. We ate Ultragrain with Quinoa Penne instead of plain pasta. My kids barely noticed a difference (I’m pretty sure they wouldn’t have noticed at all if I hadn’t insisted on filming them!) and they were loading up on protein and whole grains instead of the empty carbs they usually get with pasta. Little changes, over time, add up to big changes. Join us for #ONENEWFOOD and see for yourself! Comment below telling me what one new food you’ll try this week, then post pictures on social media with the hashtag #ONENEWFOOD (make sure the privacy setting is ‘Public’!). You could be featured on the blog! 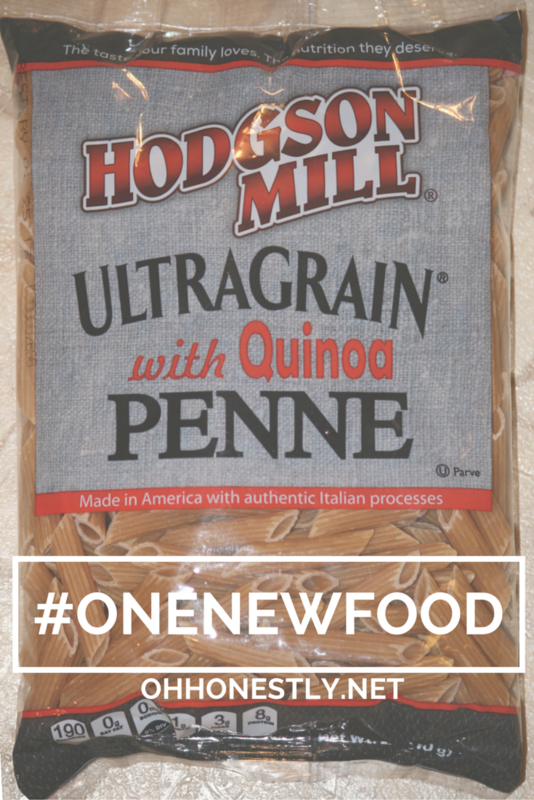 Hodgson Mill Ultragrain doesn’t have enough Quinoa in it to even raise the protein. They put something like 3% in it. This is a big advertising gimmick by a company that cuts corners on everything they do. Hi Zeck, thanks for your comment! While I don’t totally disagree with you (they are a money-making business, after all), the point of #ONENEWFOOD is to make small healthy changes for our kids. My kids would probably balk if I gave them a plate of quinoa (they don’t even like rice! ), but I think we can both agree that whole wheat pasta is a bit better for them than the alternative. Hopefully with these small changes we will eventually work our way up to real, whole foods. Love it – great vlog! And they really liked it – I want to try that pasta! I think I’ll have to make the picky one try pineapple this week. Not the canned stuff, we can get fresh pineapple year-round down here in Honduras! And if it sounds like I’m being braggy, it’s because I am. Quinoa here is ridiculously expensive so I never buy it! But I can get a whole pineapple, freshly cut up for me, for 2 bucks! Your kids are so adorable! I love the idea of filming kids- I think a lot more kids are bound to try new foods that way. When I taught Kindergarten we had an amazing healthy eating program that came in and the students tried a different, healthy food each week for each letter of the alphabet. It was awesome to watch all the kids try so many different foods (yucca, dandelion greens, starfruit, etc.). You should definitely try making quinoa for your kids though. Just make it with some stock instead of water and add some veggies, cheese, meat or really whatever you want. Now, I’m in the mood! Thanks Tricia! I think they’re pretty cute too 😉 I love the alphabet idea and how great that the school did something to encourage healthy eating!